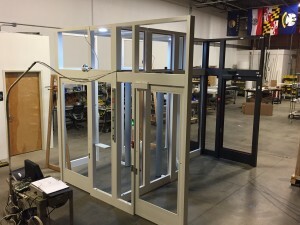 Bill Weimer of Advent Automation thinks outside the box when it comes to recommending our Safety Entrances® to his clients. You have to admire Bill’s dedication to his clients. He never stops asking “what if”? Below is one of his 2 orders heading to Maryland.The Safety Entrance® is partially assembeld and tested as part of our Factory Acceptance Test procedure. Click on the photo. It serves as a link to a video walkthrough of the Safety Entrance®. We did not plan Maryland’s state flag in the background. We were just lucky. This entry was posted in Banks & Credit Unions, Commercial Facilities, Uncategorized and tagged Anti-terrorism Technologies, Bullet Resistant Entrances, Interlocking Doors, Weapons Control Portals. Bookmark the permalink.